The Azio EXO1-K packs stellar performance into a small, compact body. If you travel frequently and need an awesome compact cheap gaming mouse, then the Azio EXO1-Kmight just be the one for you. You might even call it a game-changer in the compact mouse world. And even if you don’t hit the road too often, well, then the EXO1-K will still blow you away considering that it’s an extremely affordable mouse. Last week I tested the Azio GM2400 and I’m generally impressed with its performance, design, and the Pixert PMW3320 optical sensor. Let’s get started with the software. Azio makes it easy for gamers who don’t like to spend more than a few minutes on fooling around with software configurations. The company has completely eliminated the need to configure the software in the EXO1-K. Not only is this respectable on Azio’s part, but it’s a relief for the gaming community. After a few gaming mice go bad, there is nothing more obnoxious than spending an hour to configure unnecessarily complicated software. Another great thing about the Azio EXO1-K is that it’s compact and especially caters to the palm grip. Similarly, to the Zowie EC2-A, the compact, small size of the mouse doesn’t prevent me from being able to comfortable grip it. In this regard, the company executed the perfect balance between size and ergonomics. I got to say that I also love the rubberized grips on the mouse, because they add a certain appeal to an aggressive gamer that likes to hold on tight to their mouse. Although the mouse has a braided nylon cord, I never had an issue with snagging it on rough surfaces. 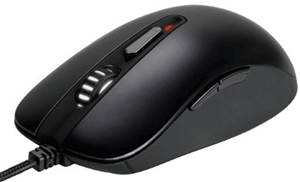 In terms of design, the mouse is an homage to the classic ergonomic shape of its ancestors. With the advent of gaming mice technology, I’m finding that a lot of companies are trying to make their products stand out in the market with ridiculous shapes that only make gaming more difficult and, also, less comfortable. That’s a big no-no for me. I want a gaming mouse that’s going to feel good when I use it. The design is simple, yet sleek, which is partly achieved by Azio’s backlit logo and discreet red buttons. However, it should be noted, that this mouse is designed for right-handed players (sorry lefties). 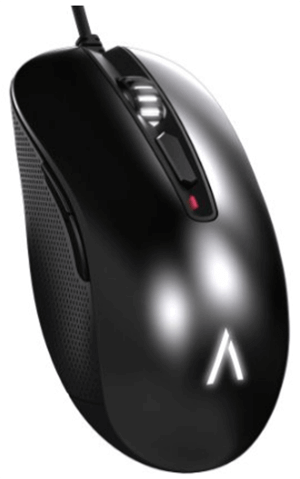 Overall, the Azio EXO1-K delivers comfort and a sleek design at a low-budget price. Buttons…Buttons…Buttons. They’re really nice for applying extra features to your gaming mouse, but they’re really annoying when they’re poorly placed. DPI is easy to change with the on-the-fly adjustment button on top of the mouse. Even better, the DPI adjustment button isn’t obnoxiously placed on the scroll wheel. It has a dedicated spot just below it. During the two hours I used the mouse in a game of League of Legends, I never accidentally changed my DPI when I didn’t want to. I also found the two side buttons to be well placed and responsive. Although they felt somewhat cheap, the Azio EXO1-Kdoesn’t deserve a reputation for sticky buttons. What really takes the EXO1-K to the next level is its sensor. The Pixert PMW3320 optical sensor performs exceedingly well in terms of accuracy, speed, and sensitivity. In my experience, there is no objective qualities that make an optical sensor better than a laser sensor. Yet, if you were to ask me which one I prefer I would answer “optical,” because in my experience they’re more reliable and less prone to simple hiccups. The tracking on this mouse is excellent not only for gaming, but also for everyday use and programs like Adobe Photoshop where accuracy is the difference between high- and low-quality. 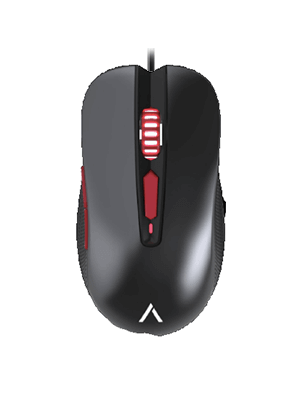 So, if you’re looking for an affordable mouse with a highly responsive sensor, then look no further, because the Azio EXO1-Kis your best bet. Lastly, I want to talk about the quality. As with any cheap gaming mice, there’s going to be a few faults here and there, but let me tell you…Azio really minimized cheap quality by creating an all-around superior mouse. The design speaks for its performance and vice versa. The vacuum plated technology make this mouse a durable and sturdy device. Along with its compact size, it’s well prepared for traveling and dozens of gaming sessions. The bungee cord is also well-built. Overall, the Azio EXO1-Khas a solid feel with a decent amount of weight. I want to conclude this review on the Azio EXO1-K by mentioning it’s stellar performance and top-notch design and quality. Although it may not be the best option for left-handed gamers, Azio really executed some hard-to-keep promises in the gaming mice industry. Thus, without sacrificing performance and without sacrificing design and quality, the company created an all-around excellent gaming mouse at an affordable price.